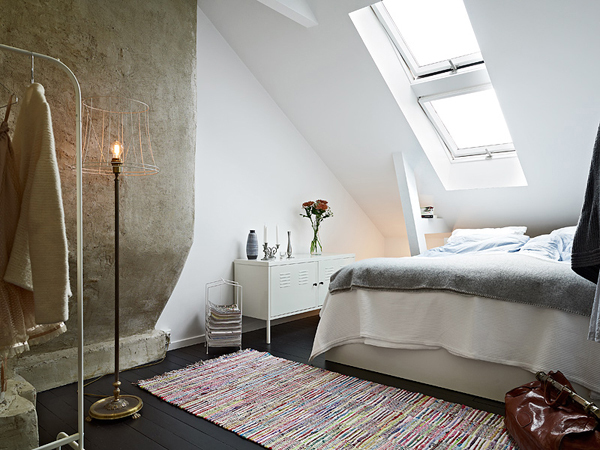 This room looks really tiny, but I have a thing for sleeping in small spaces, so I love this! This room doesn't feel overly designed, and I love that dark floor and cement wall against the all white walls. It also has my favorite features in any room, vaulted ceilings and a skylight! I love sleeping with the windows open, but I'm always a little nervous about doing it for security reasons. That wouldn't be an issue if I had a skylight. The one thing I don't like about this room is the exposed clothes rack. I know they're really popular, but I think they look a little messy. Plus, with this room being so small, it feels a little too cluttered visually. PS. I love how they've used that little architectural feature as a nightstand. See the rest of this beautiful house here.